Hello, friends! Today I’m excited to join the Spellbinders blog hop celebrating the launch of Shadowbox collection by Becca Feeken. I’ve been a long time fan of Becca and her genius designs for layered dimensional cards. 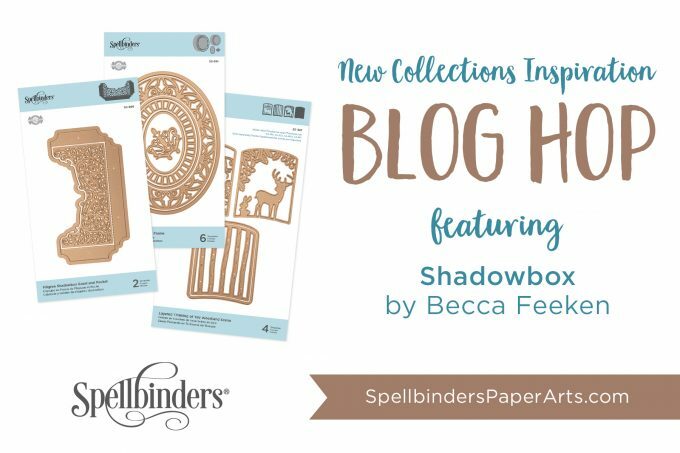 Becca’s latest collection is called Shadowbox is it perfect for all things 3D and also idea to make boxes for those dimensional handmade cards. Win-win! This collection also coordinates with the Elegant 3D Vignettes one released in 2018. While these types of projects is not something I do often as I mostly gravitate towards the Clean & Simple style, Spellbinders dies and layered cards were the first things I have tried in my cardmaking journey. I still very much love and enjoy this style, I just don’t create in it as often. Today I have a sweet shadowbox to share with you. When I was making it I envisioned it as a piece of home decor, something to put on your desk or hang on a wall, perhaps. It was just when I had re-arranged my IKEA Pegboard and was thinking that I need some sort of handmade decor piece to go on the board to pretty it up. The size of this shadowbox is 5″ x 5″ x 3/4″. With the Shadowbox collection you are the boss of size and can make your box any size you like (the depth can be 1/2″, 3/4″ or 1″). The dies to make shadowboxes are a little tricky to figure out, but there are video tutorials available that will show you how to put them together (here’s also a great one by my friend Kathleen). Once you’ve made your first box it will be very easy to make them again. I used plain white cardstock for the box itself. I backed it up with pretty pink paper and decorated with some die-cut butterflies and flowers. Both were made using dies from the Shadowbox collection. 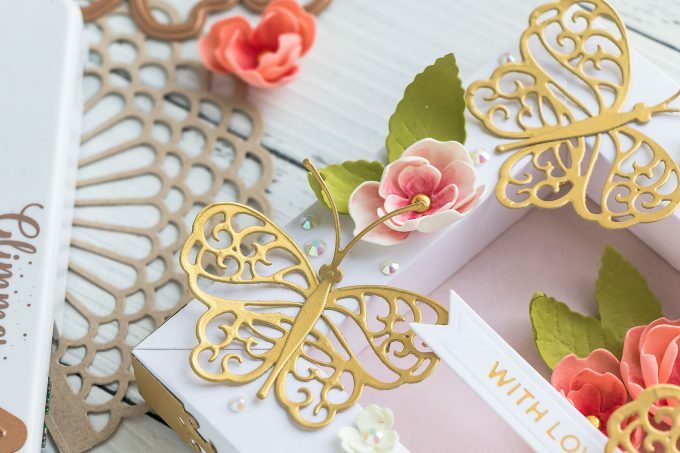 The butterflies were die-cut from Journey Brush Gold cardstock and the flowers were die-cut from foamiran, colored with Copic markers and shaped with a heat tool. 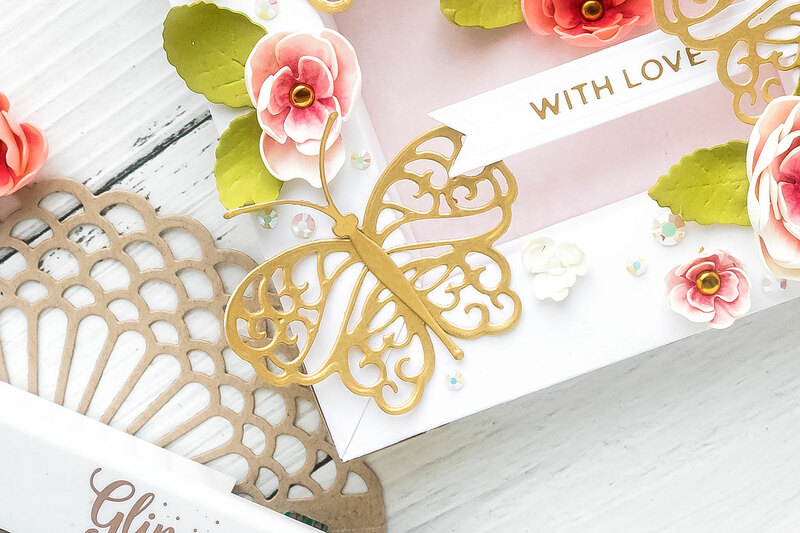 I also added a little “With Love” banner and this was created using the Spellbinders February 2019 Glimmer Kit of the Month and Matte Gold Foil. In case you haven’t see the new Glimmer kit – do check it out, it’s one of those must have kits! Btw, another sentiment set like this is coming soon from Spellbinders. Where available I use compensated affiliate links which means if you make a purchase I receive a small commission at no extra cost to you. Thank you so much for your support! If you arrived from Jean Manis, I’m the last stop on this hop.You can also start over on the Spellbinders blog. To celebrate this release, Spellbinders is giving away a $50 gift certificate to 3 lucky blog readers – selected from the comments across all of the blogs in the hop. Giveaway closes on Sunday, February 10th 11:59 pm EDT. Winners will be announced in the Spellbinders blog hop post the following Monday. Winner is responsible for shipping cost, duties and taxes. What a neato set of dies! I have so many ideas in my head! Thanks for sharing your version. What a gorgeous shadowbox Yana. Love the sweet butterflies and those layered and shaped flowers… wonderful dimension… pretty colors. Love this, it’s so delicate and beautiful. Your box is beautifully done. I like the pinks and flowers. Those butterflies look lovely. What a gorgeous present to give to someone for Valentine’s Day, anniversary, or just because.The gold, white, and pinkish red work so well together. Definitely to be treasured!! Gorgeous design. I love the new shadow boxes. The more I watch the videos using this die, the more excited I feel about it and look forward to placing an order. I remember a while back (when you still lived in Phoenix) writing to you asking if Spellbinders would PLEASE make a die to create a box for cards with loads of dimension. You told me (if I remember correctly) that Spellbinders was considering it. They not only came through, but went above and beyond!!! Such a versatile die and I already have quite a few projects in mind using this die (and I haven’t ordered it yet!!). Also, thanks for the video showing some of your time at the creative craft show in Heidelberg. I enjoyed it. Just adorable, every single little detail! What a beautiful shadow box! I love the combination of papers and colors. This is really lovely. Thanks for sharing. Blessings. Beautiful shadowbox with a “touch of elegance”. Your shadowbox is a card to me and one of the prettiest I have ever seen. I love everything about it. Wow! Such a lovely, elegant, and romantic looking shadow box – it is so lovely! Oh Yana, I love this box with the butterflies and the foamarin flowers. The colors are so so attractive. I agree it is nice to have it for a place on our shelves to brighten up the place. Thank you for sharing. Beautiful. What a unique way of making a card. I can see a nice little trinket inside the box. It would be a great surprise for the recipient. Very pretty. I can see a little trinket inside the card. It would be a nice surprise for ny niece. Love the flowers and butterflies. Lovely work. Thanks for sharing. This beautifully showcases the new box dies. The palette is so delicate and it is versatile for so much more than cards. Thanks for the inspiration. Super cute. Thank for showing. Wow! This is stunning! I love the flowers. I love the shadowbox you made with the new Becca Feeken dies. 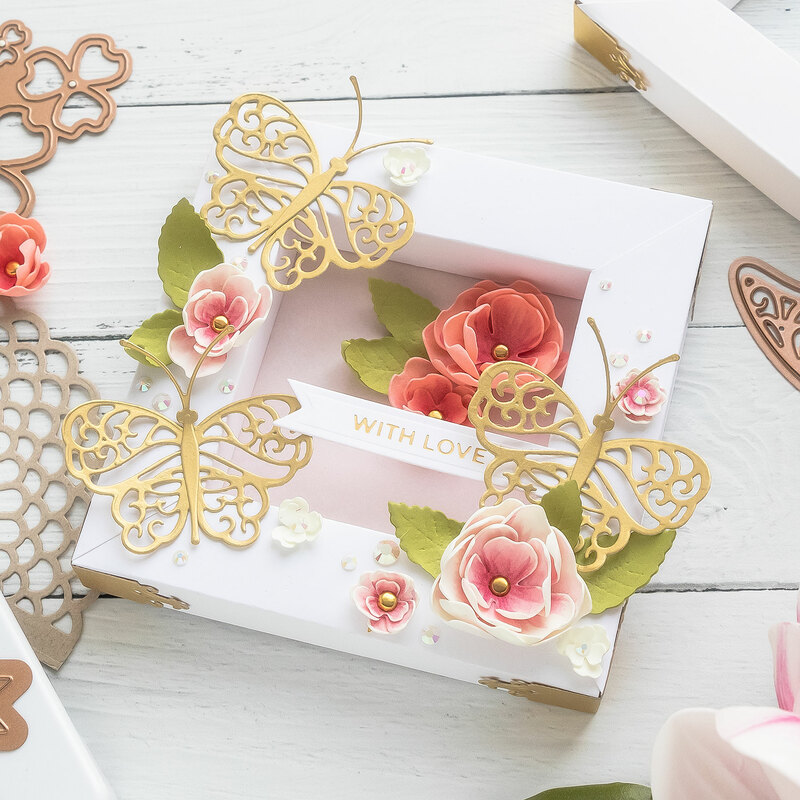 The butterflies and flowers you added as embellishments highlight some of the additional dies in the collection. It makes such a lovely decor piece. Thanks for sharing your creativity. Absolutely gorgeous! Love your attention to details, as always! Your flowers are beautiful with the extra touches of color! This is sure to inspire you in your craft room! I love how you paired so many of the new releases all together so effervescently!! Gorgeous and breathtaking all at the same time! Gorgeous shadowbox! Love the design. This is so lovely! I love the ink and gold. Yana, that’s a beautiful shadowbox. I love those delicate butterflies. So lovely. Those butterflies are so pretty. So pretty with the flowers and butterflies. 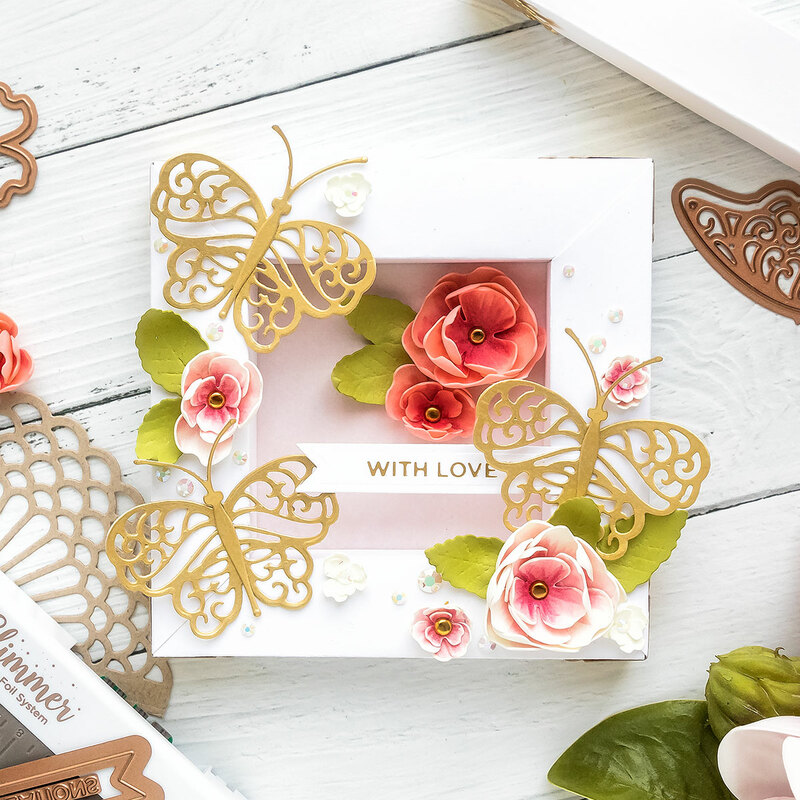 Beautiful, LOVE butterfly and shadow box dies! Absolutely beautiful shadowbox project! So pretty! The butterflies and details are lovely! 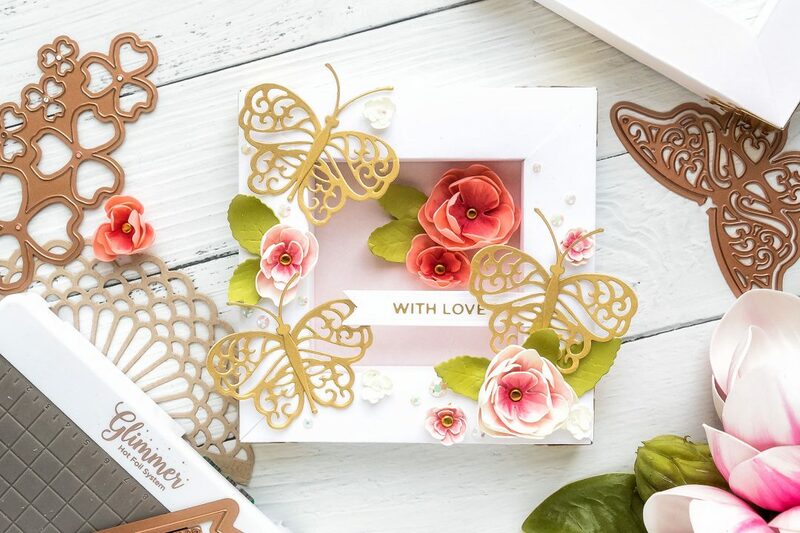 hello MISS YANA< thanks for allowing us to view your projects they are stunning i love the FLORAL DIE AND OF COURSE THE BUTTERFLY gentleness add a special flare. Thanks again!